This past week I went to BAM (the Brooklyn Academy of Music) three times to experience three quite different events, proving yet again how versatile and amazing of a venue it is. BAM calls itself a "multi-use, urban arts center bringing international performing arts and film to Brooklyn" and is basically a complex of two large theater stages, several movie theaters and a big cafe also utilized for live performances. And it's so close to where I live that this cultural mecca is my neighborhood live performance and movie theater. I just love living here! 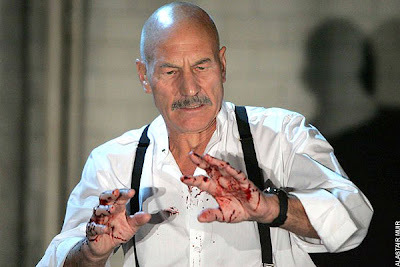 This week I saw the stunning opening night performance of Macbeth, starring Patrick Stewart (and "featuring" William Shatner in the audience) at the beautifully designed Harvey Theater with its run-down chique. Magnificent. Personally I loved the witches and the music and colors during their sections the best. But then I sat a little too far away to really appreciate the subtler nuances of the actors' performances. The show is currently sold out for the remainder of its planned stay at BAM. But there are rumors of an extension. Add to that a late night dinner at Junior's with the best cheesecake in town and you have a perfect date for a group of 8. Then there was a spontaneous "let's pay our check and head over to BAM to see a movie" screening of Persepolis, which was also fantastic - informative, moving and funny. What an incredible accomplishment. Since then I've heard several times that even in this case of an animated movie based on two graphic novels, the books go even more in depth. In any case, don't miss this one. To round out the week I was lucky to get a ticket (thank you, John!) to one of the two sold-out shows of The National playing at the grand Howard Gilman Opera House. In addition to their usual line-up they brought a brass and a woodwind section, some strings and a grand piano. Seeing them play at little Hamburg club Knust a few months ago has to be one of my favorite shows of recent years. But the quality of sound due to the instrumentation, the quality of equipment at the opera house and the spaciousness of the BAM Opera House was something else. Even the visuals of the tall stage with the long silvery curtain and the changing lights, the dozen musicians with the various instruments and of course the huge space of the room itself made this experience simply beautiful. Sitting down through most of the concert in theater seats though: unbearable! I can't wait to see The National again while being able to move freely and I'm always looking to BAM for some great culture and entertainment.